Spanish Omlette with Nachos Recipe: A quick, easy and appetizing breakfast! This spanish omlette is cooked between diced potatoes and vegetables with a dash of pepper, salt and loaded with parmesan cheese. Topped with nachos, pica de galo, guacamole and sour cream this dish is a must have on your breakfast table! 1.Heat the frying pan first. Fry the onion, green pepper and garlic. 2.Add a little pepper and salt. Set the vegetables aside. 3.Use a potato as base, diced potato and put it in the pan, add the eggs on top. 4.Add the vegetables on top, like adding pizza toppings and add a little pepper. 5.Add tomato ketchup and Tabasco followed by parmesan cheese. Put the lid on. 6.If you don’t have time, flip it. If you have time keep it on the fire to let the cheese melt before flipping it over. 7.Serve it on a plate. 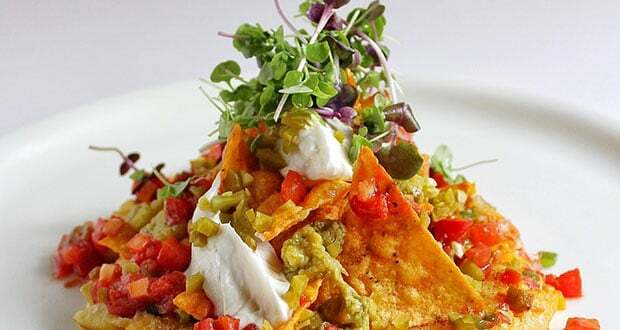 Top Nacho’s with your hands and decorate with pica de galo, guacamole & sour cream on top.